Made-to-order two-piece porcelain French butter keeper with a teal, turquoise and aqua ombré pattern. Use as suggested for fresh spreadable butter anytime. Approximate Size: Height 3 ¾", Diameter 3 ¾" at the rim, holds one stick of butter, 4 oz. Size of made-to-order pieces can vary up to ½" from the images shown. 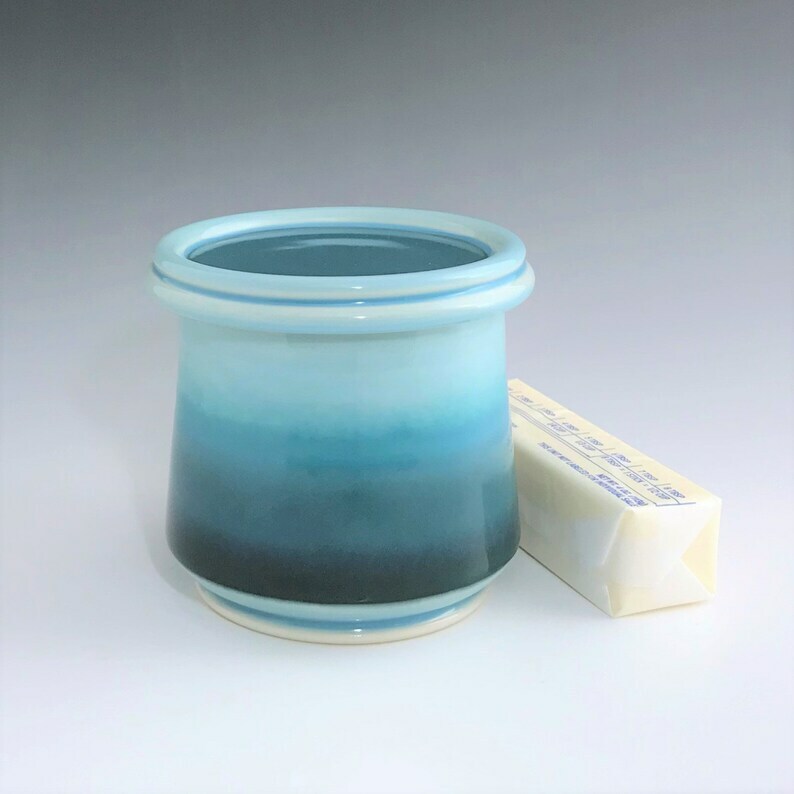 Each butter dish is handmade individually and there may be slight variations in size and glaze patterning. Pack up to a stick of softened butter into the cylinder on the underside of the lid. Fill the bowl with about 1" of cool water and store closed (Image 1). The butter will stay fresh at room temperature for about a month if the water is changed every few days. This listing is for one french butter keeper. A card with directions for use will be included. Other pieces pictured are listed separately, if available. The bottom of each piece of pottery is sanded and polished so that it is comfortable to the touch and will not scratch any surfaces. I made this butter dish on a potter's wheel using high-quality porcelain. The ombré pattern is hand painted using underglazes. I mix all my glazes from scratch using only non-leaded ingredients. The final glaze firing reaches 2,232°F ensuring that the pot is safe for use with liquids/food and can be used in microwaves and dishwashers.